Read on, let your mouth water and of course enter the giveaway! PEI, Canada, chances are that you’ve had this place on your agenda and stopped in for a visit. PEI Preserve Company is located on the river on the Clyde, nestled below the rolling hills of the breath-taking New Glasgow, Prince Edward Island, Canada. We’ve always admired the beauty of the PEI Preserve Company driving by, but have never stopped in. I have no idea why we didn’t! Really, I’m not sure what we were thinking. We’ve definitely been missing out on being spoiled by an absolutely amazing local company. On the day I was to choose my review products, I had taken my daughter Hannah with me. She loves jam’s and jelly’s. To our surprise and to our delight, they had samples of just about every sort of jam, jelly and salsa that they make ready for customers to try. Hannah and I had a field day! We choose two products to review. Bruce, the owner, had asked us to review 3-4, but we couldn’t make up our mind! We loved them all! 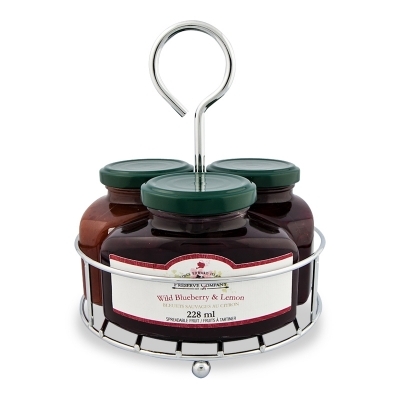 Our most favourite is the Wild Blueberry with Raspberry & Champaign spreadable fruit. We just love it! There is no other way to describe it. If I compared it to my Grammy’s or my Mom’s, I may get in trouble, if you know what I mean. Within two days, the kids had this delectable heavenly spreadable fruit, gone. Yep, the bottle is empty. not like anything I’ve ever tasted before. service. I am pretty sure the kids and I will be stopping in a few times this summer for a delicious breakfast! Garden’s of Hope, which is the adjacent property. I can’t even begin to describe to you how beautiful this property is. I don’t think there can ever be a better description then the one you will find on their website. Pack your suitcase, cause your coming to PEI! few hours. Arrive for breakfast, visit the Gardens of Hope and pick up some treats from the shop before you leave. and greeting visitors as they arrive. 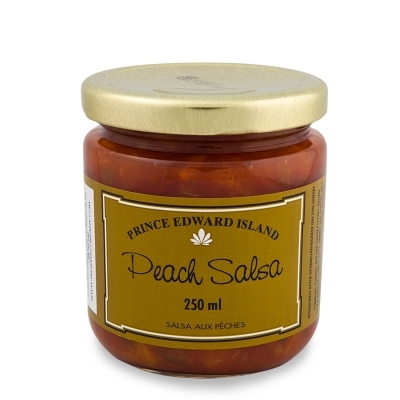 How would you like a little taste of PEI, Canada? The honey with amaretto or grand mariner sounds unique and yummy! The LEMON & GINGER WITH AMARETTO MARMALADE sounds heavenly! I would love to try the sour cherry salsa. The apple-cinnamon curd sounds great! I would like to try the Raspberry Fruit Sauce. The Fab Five Gift basket! Tasty!!! Sour Cherry Marmalade sounds DELISH! The chocolate rum fruitcake sounds good!! The blueberry lemon preserves, sour cherry marmalade, and the garlic mango dressing. I couldn’t pick just one. HABANERO & MANGO BBQ SAUCE, Sounds yummy!!! The Crabapple jelly and the strawberry preserves look delicious! I would LOVE to try the Tomato and herb BBQ Sauce. ,and the tea pots are so adorable. I would choose Fab 5 Gift Basket 2. The flavor choices in this basket sound delicious, especially the Wild Blueberry…My favorite!! i would like to try Apple & Cinnamon Curd. I’d like to try the Strawberry Grand Marnier. I would like to try the Fav 5 Gift Basket 1. I would like to try the maple syrup. I would love to try everything in the Fab 5 Gift basket! I love their teaware! The strawberry teapot is adorable. I would be interested to try Mrs McGarrigles Mustard, Creamy Champagne 190ml. I’d love to try their CREAMY EARL GREY tea. Would love to try the Earl Grey Black Tea. I would LOVE to try the Tomato and herb BBQ Sauce. I love visiting PEI it is such a wonderful place. Preserve Caddy Gift Basket 2. The Strawberry Grand Marnier sounds heavenly!